Die hervorragende Lage zieht sowohl Urlauber und Geschäftskunden sowohl für kurze und längere Aufenthalte von 1 Woche bis zu mehreren Jahren. Vorherige Mieter sind: Deutsche Bank, Ernst & Young, Pricewaterhousecoopers, das Royal Opera House, Chicago The Musical und Borders Books-Music-Videotheken. Wohnungen in diesem mittelgroß "Hochhaus" Block 6 Stufen starten vom Straßenniveau und Zimmer verfügen über Doppelglasfenster, so dass für eine solche zentrale günstige Lage, kommentieren viele Kunden auf, wie ruhig sie sind. Es gibt zwei schnelle, ziemlich große Personenaufzüge so brauchen Sie nicht mit vielen Treppen zu bewältigen! 1 x Superking (UK 6 Fuß breit x 6ft6 'lang) und Schlafzimmer 2: 2 x Singles (UK 3ft breit x 6ft6 "Die 2 Schlafzimmer sind als Schlafzimmer 1 angeordnet lang). Ein FLOORPLAN der Londoner Wohnung zu sehen, die auf Fotos klicken und es in der Galerie zu sehen. Die Lage des Londoner Wohnung anzuzeigen, klicken Sie auf der Karte oder der Standort Anzeige / Tab. Der nächste Londoner U-Bahn-Station ist direkt vor dem Gebäude und ist Tottenham Court Road (an den Übergängen von der Oxford Street, Charing Cross Road und New Oxford Street). NACHRICHTEN ! : Die U-Bahnstation Tottenham Court Road wurde von der Londoner U-Bahn-Station umgebaut, um die Verkehrsüberlastung zu verringern, mit einer neuen Tickethalle, die fast sechsmal größer ist, stufenloser Zugang und verbesserter Austausch. Die neue Crossrail-Linie ist ab 2019 in Betrieb und bietet 24 Züge pro Stunde. In 30 Minuten gelangen Sie mit Tube-U-Bahnen von Heathrow direkt in die Wohnung - die Hälfte der vorherigen Zeit! Vor dem Center Point entsteht eine neue Plaza, an der sich viele Restaurants im Freien befinden. Bitte beachten Sie, dass daher auf der anderen Straßenseite Bauarbeiten stattfinden (nur tagsüber). Auch wenn der Lärm nicht unangemessen störend auf unser Gebäude wirkt (wir haben auf jeden Fall eine Sekundärverglasung), sind die Aussichten aus der Wohnung vorübergehend weniger attraktiv Ergebnis. Bitte beachten Sie: Diese Eigenschaft ist jetzt für die Spezialisierung auf Langzeitvermietungen (dh keine nächtlichen Mieten) eingerichtet. Wohnung Informationen Handbuch, von A bis Z Straßenkarten, Restaurantführer und Touristeninformation Flugblätter und Zeitschriften in allen Wohnungen. I stayed at this beautiful property with two roommates for four months and couldn’t be more thankful for this place. It was the perfect size for three, comfy, cozy but still spacious, clean, and had everything we needed. From converters, to a large TV, hair dryers, plates, silverware, a great electric stove top, fans, comfy bedding, multiple towels, cleaning supplies, and more this place really had everything we could have ever needed. 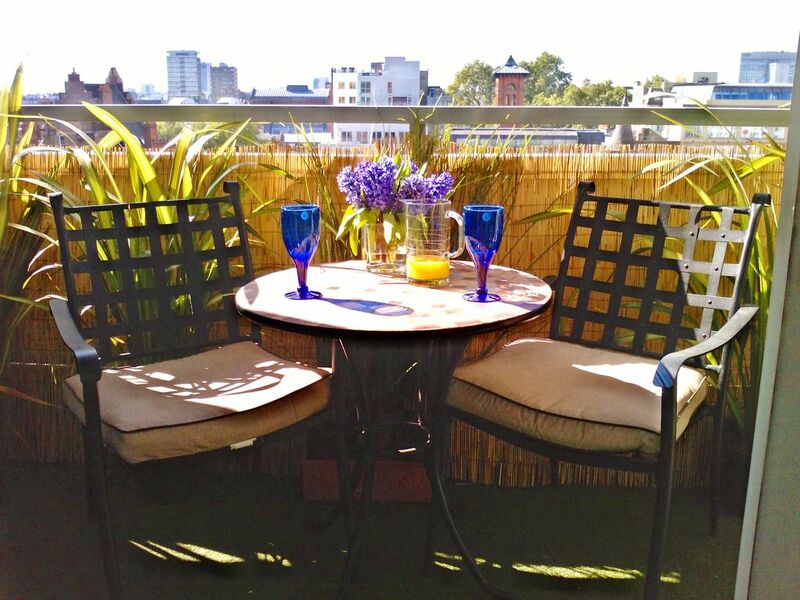 The heating system was great, the living room was perfect for intimate get togethers, and the balcony was delightful. The washer dryers are only a floor above and there are 8 within the building, free of charge, which was awesome. The building itself was quiet and in an extremely optimal location right next to oxford street and the theater district. Everything you could possibly need- great restaurants, supermarkets, drug stores, entertainment, and night life is all within a 2 minute walk. The landlord was very kind, helpful, and accommodating and check in and check out was easy and thorough. I couldn’t be happier with my long-term stay here and recommend it to any and all! Great location, certainly is central. The apartment is well equipped and convenient. It was a serviceable location for our stay. The beds are very comfortable, abundant towels and good clothes washing facilities one floor up. I was fascinated by the architecture. I would guess the building was built in the 1960's to very high quality. As the lift shows only flours 3, 5, and 7 are apartment entry floors. We were on the 3rd floor. The door to the apartment is on the left when you are in the hall. Immediately there is a kitchen with fridge, cook top, oven, toaster, coffee maker, sink and dishwasher. To the right as you enter are straight up stairs and slightly right the sitting area with balcony cutting the far corner of the sitting area. There is a lot of furniture for a relatively small space. I suspect the owners entertain a fairly large number of people. Up the stairs, one does need to get ones own bags up. The surprise is at the top the bedrooms now cover a space greater than the downstairs. The master bedroom is on the right and overlooks the street (it was quiet.) The guest bedroom is on the left. This allows great airflow as each room has large windows completely across the wall they are on. Good double-glazing to keep the street noise and construction noises out. There is a full bath with tub and a guest bath. If you are a fan of architecture, especially mid century, this apartment is a very interesting example. Shopping is easy. There is a Boots just up Tottenham Court Road a little further there is Sainsbury's a little further is Planet Organic, which has organic foods and prepared foods. Not to mention the flagship Foyles bookstore on Charing Cross Road. Seven Dials is a 5-10 minute walk. The restaurants of Soho are in one directions and Covent Garden is in the other. Bloomsbury is north along with the British Museum. The theatres of the west end are very close. Great location. Great detailed review, so many thanks. You are spot on with the architecture's build date and I'm glad you found it was "to very high quality" and that you loved location. So do we, even after all these years! There is furniture for 6 persons, which is rarely ever needed it is true, so for just the 2 of you I can see it would seem like a lot. For a summer stay, it is good to hear you found the flat quiet and that the glazing kept out any construction noise. Enjoyed staying at this clean and centrally located duplex. Tons of restaurants, stores around and access to Underground is 1 minute away! Thanks for your 5-star review! very convenient and quiet even though construction outside. Able to relax and walk outside to shops. very good place which I would recommend as convenient and comfortable. good organisation to access property. Thanks for your recommendation and your lovely phone call on check out! Yes we would love to have you come back again. We stayed in this great apartment for our Spring Break Trip to London. My wife and I took our two boys (ages 9&11) for a week in the city. The apartment is great. There is quite a bit of construction in the area but was very quiet at night. We were out touring most of the day but even if we came back during the day I would classify the noise as just city noise. Bedrooms - One room had two twins for the boys and the other room has a real american king. Confortable mattresses and very quiet. Kitchen - Full size fridge and full kitchen although we only used the fridge. Bathroom - 1 1/2 upstairs. Having the extra 1/2 was helpful for the four of us. Shower / tub is good. Patio - There is a small patio that was nice to have a coffee or drink at the end of the day. Den - Nice tv with alot of channels. The unit we stayed in had a small table for dining, two arm chairs and a large couch. Wifi - Great signal downstairs, ok upstairs. Location - Couldn't be better. I could see how some might have a hard time finding the door but we walked straight too it. The directions they provide are very thorough. The subway is right around the corner, a lot of restaurants in the area. I would recommend the Flat Iron which is just down the street. Once they finish the train from Heathrow to the station on the same block it will be even more convenient. Many theatres are close by as well. Laudry - full washer and dryer on the floor below. We washed mid week and had no issues. Manager - Si couldn't have been better. He gave a thorough run down of the unit. Booking - Si replied right away to confirm availbility. They do request a credit card outside of VRBO that did seem a bit "shady" but I once i spoke to Si I felt better about the arrangement. There were no issues. Overall a great experience. Location was fantastic and we would rent this apartment again. Thanks to Si and team. Thank you for a perfect review! So glad our efforts made for a great stay. As we do not charge any security deposit, or hold any extra monies from our guests, we do like to ensure we cover any loss of keys, minor damages with card details upon arrival, and also as a way to check guest IDs. This has been our policy for 20 years, way before VRBO was bought out and started taking payments online - we used to handle all the payments ourselves. Now people are questioning why we ask for them (yet ALL hotels do at check in, no matter which site you booked on). We may review the policy, and see if our guests are happy to pay a deposit in future, and wait for it to be returned after they have left. Generally we have preferred to work on trust and have not seen the need for withholding extra funds, but the market has changed and maybe people are happier with that? Anyway, the team is delighted to read your review and send their regards. Great place, service and price. I arrived early, so I needed early check in - Si was very helpful and allowed me to check in earlier and checkout later too. Great apartment spacious, bright, clean and comfy bed. Great location, theatres, cinemas, restaurants and shops are walkable distance. Great place to recommend for single, couple and families. Auswahl aus mehreren nahe gelegenen Fitness-Center mit Fitnessgeräten, Schwimmbäder, Wasserdampf, Saunen usw. nur zwei Minuten zu Fuß von der Wohnung, sowie zahlreiche Heilbäder / Massage / Beauty-Behandlungen, Kinos usw. SHORT STAY RENTALS (including bills): 1, 2, 3 or 4 weeks @ £1250 per week / £5000 per month; 13 weeks @ £1000 per week. Please check by message with us first for any discounts that may apply on your dates LONG STAY RENTALS (excluding bills): If you prefer to pay UTILITY* suppliers yourself, the following discounts are currently offered for these long-stay rentals FULLY PRE-PAID IN ADVANCE 6-MONTH+ /26 WEEKS to 12-MONTH/52 WEEKS from £625 to £695 per week (*UTILITIES are: Council Tax, Water Rates, Electric, TV Licence, Phone + Internet).